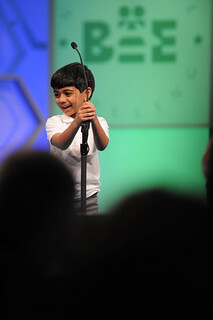 Akash Vukoti, speller 238 and the youngest speller in the bee, was eliminated on "bacteriolytic." He asked Dr. Bailly for the language of origin, the definition, the part of speech and to use it in a sentence. Akash, a six-year-old first grader from Texas, received a standing ovation when he misspelled. Still as the microphone, he gave a speech to a standing ovation from spellers and audience members, and thanked Dr. Bailly and Bee director Paige Kimble. "Good luck to you and I hope I see you next year," he said. Alex Iyer, speller 239 and a Texas seventh grader went up to Akash to high-five him before he left the stage. Alex spelled "hydrophore" correctly.